London Guide – History Fans Will Love It! London has seen some turbulent times. It has survived plagues, the Great Fire of London and two world wars. Despite all this, the capital of the United Kingdom still has its fair share of sights for history lovers. The Romans named it ‘Londinium’ and brought the town into the civilized world. It’s hard to imagine the Roman face of London, but there are remains from that bygone age. Near Moorgate stands the remnants of an ancient wall built around the City of London and on Cannon Street is the curious London Stone, said to be the marker from which all distances in the city were judged. After the Romans left, London faced turbulent times, but Edward the Confessor managed to take Westminster Abbey and turn it into a grand Romanesque building. Later on, Henry III would alter the Abbey and leave London with the stunning building that can be seen today. The Tower of London was established in Mediaeval London and was first used a royal residence. It is one of London’s most famous buildings and has housed an armoury and even a zoo before it became synonymous with torture and death. It is a must see on any London tour. St. Bartholomew’s Priory in West Smithfield was built in 1123 and is London’s oldest church. Westminster Hall was under construction and formed the basis of the Houses of Parliament. London prospered under Tudor reign. The parks were established – Richmond Park, Hyde Park, Regent’s Park and St. James’s Park were used as Royal hunting forests. The original Globe Theatre was built but didn’t survive the Great Fire and the modern replica stands in its place. Inigo Jones changed the landscape of London. Covent Garden Piazza and Queen’s Chapel in central London show the city in the 17th century. The plague and the fire ravaged London including St. Paul’s cathedral. Christopher Wren set to rebuilding the cathedral and many more of London’s churches. Westminster Bridge, the British Museum and houses such as Syon House and Chiswick House were all born in the Georgian period and George III moved into Buckingham Palace, or Buckingham House as it was then known. John Nash designed Regent’s Street, Piccadilly Circus and Oxford Circus. The clock tower known as Big Ben was built and the Houses of Parliament were rebuilt in 1834 as Georgian gave way to Victorian. 21st century London is two thousand year mix of styles, architecture and eras and every corner reveals a different face. 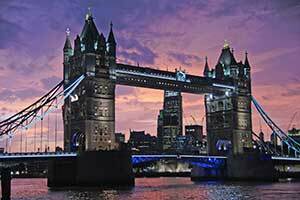 Click Here for the Best London Hotel Deals!